Ridley Scott's Prometheus may have people talking Alien again, but face it - the sci-fi beasts of burden and acid are never far from the minds of fans. Just ask Norwegian graffiti artist Asker Farvehandel. 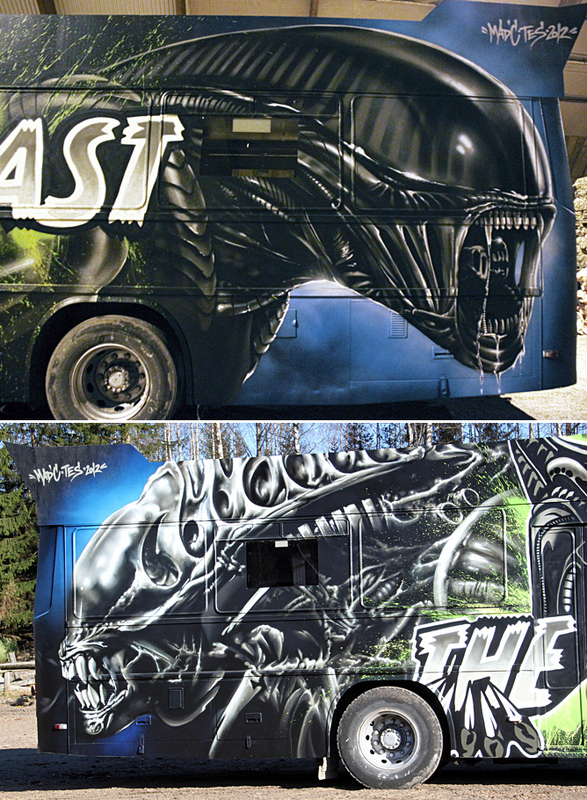 He's the dude that has spearheaded the conversion of this bus into one on-road, massive mountain of Alien mean, simply titled The Beast. Forget Norway's stunning landscapes, if I was driving round the country, I'd be spending all my time overtaking this multi-wheeled masterpiece, just to park, let it drive by, then overtaking it again, so I could grab another look at it's detail! Better yet, as all good artistic projects of size are known to do, Asker even created this sweet wee time-lapse of The Beast's creation. Drool over it when you're ready. Hell yeah! let the bug hunt begin this is friggin awesome! 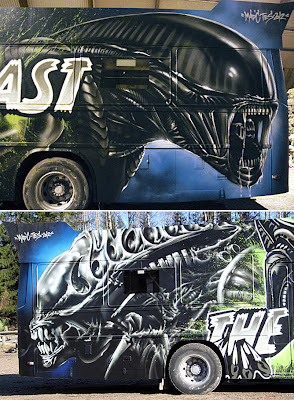 I think Aliera, you and I and the gang have found our Comic Con vehicle Dave! what do you mean "our" vehicle mate?